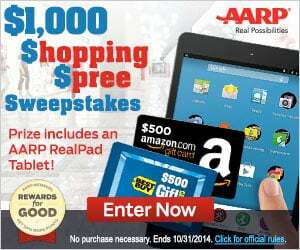 How would you like to win a $1,000 shopping spree courtesy of AARP? AARP members can enter the AARP Rewards for Good Contest for their chance to win the big prize! If you are already a member of AARP, rewards points are waiting in your account. Sign up to redeem the points by clicking here. You can earn 50% more points for free when you head to the site and complete activities on the site. To earn rewards points, simply complete activities on AARP.org covering topics such as health, dating, retirement and more. You then will be able to redeem your rewards on over 200,000 items. But hurry, the contest for the $1,000 ends this October 31st!